Ashley Costelloe and Pink Awful ensured the Lincoln Lounge did not go gently into that good night. Ashley Costelloe of Pink Awful spent her late teens and early 20s playing in bands around Reno. After a break from performing, she returned with vigor. “I reached a frustration point and just wanted something solid,” Costelloe said. 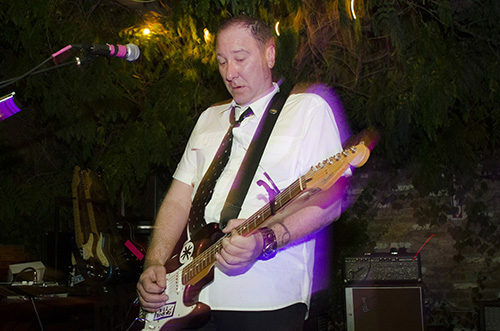 She put out feelers on Craigslist and found Mike Miller, guitarist/vocalist and songwriter. They were both looking to start a band, but ended up dating, as well. Talk about a casual encounter. Sorry, Craigslist joke. Around that time, Pink Awful’s guitarist Daniel Lawson and drummer John Walker were in a different band. They opened for Costelloe and Miller’s first show. Afterward, Walker told them to consider him if they ever needed a drummer. Costelloe and Miller worked as a twosome before they united with the rest of the group. Costelloe wrote all the lyrics and melodies, then new members came along and added their personalities. They found bassist Dwight Struthers because he and Lawson went to high school together in Grass Valley, California. Pink Awful has been together for about a year and a half and just released its first record, “Potboiler” at Lincoln Lounge last Saturday. The collection of nine songs was recorded by Rick Spagnola at Dogwater Studio in Reno and is a culmination of songs the Craigslist lovebirds first wrote together. Miller credits Costelloe’s passion and melodies for the actualization. Pink Awful stands somewhere between Florence and the Machine and Sonic Youth. Costelloe’s bold voice and stage presence carry the power and mystery of Cher. Effect-laden guitars build melodies and are spastically embellished by experimental guitar parts flaunting harmonics and intricate noodling. Vocal parts often are balanced between Costelloe’s mature growl and Miller’s deep and steady baritone. “Potboiler” is full of successes. “Weight of Worry” has plenty replayability. I found myself singing it hours later. “Jarreee” displays a Nirvana-esque edge and looseness. “Lamps and Torches” is an emotional wave that peaks on Costelloe’s pained shouts and Lawson’s triumphant solo, which bends through the track with feeling and then gets faster and faster until he’s shredding like a madman. “Opening Song” and “Life Rots (In Your Hands)” close the album wonderfully. The former starts with scratching guitar strings and cavernous tom drums. It builds to Costelloe’s most impressive vocal performance on the record, a mix of power and pain. The track segues into the final 6-minute epic with upbeat drums. Both singers blend and dissolve into one as the album finishes. Costelloe and the rest of Pink Awful hope they are adding something new and enjoyable to Reno’s music scene. This opinion is shared by others. Rémi Jourdan, founder of Tunetrax, former-owner of Club Underground and booking agent extraordinaire, thinks the band is something special. Pink Awful played a show at Lincoln Lounge a few months ago and loved the outdoor stage. When it was time to release the album, they wanted it to be in the landmark Reno bar. They were both depressed and honored by the task. Skew Ring of Reno opened the album-release party with reverbed drums and a singer jumping off of tables full of fans. Mid-song, both bands harbored focused professionalism. Costelloe used a megaphone a handful of times, something I see frequently in Reno. She took the art a step further when she used the built-in siren throughout a noisy transition. Pink Awful has a cute kinship onstage. Struthers and Lawson play to each other and are quick with jokes and banter between songs. During one break, Costelloe said “damn” for some reason. 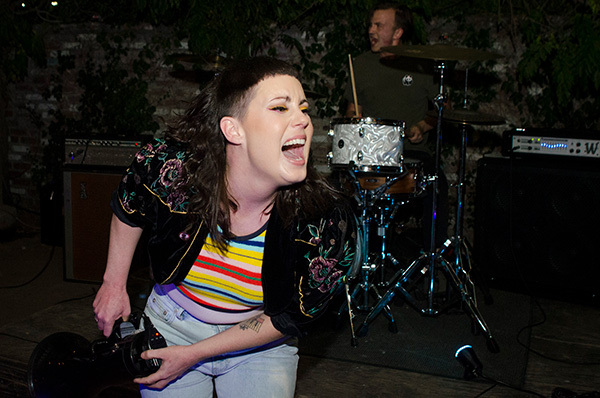 Between songs featuring bold, talkative guitars and a frontwoman with an abundance of energy, they were ready with jokes. During another breather, they thanked Craigslist for sponsoring their band. I’ve been shooting bands for a “living” almost 10 years, and I can honestly say this is the first time a musician has shaken my hand and thanked me for coming mid-set. They’re endearing, thankful and honest. 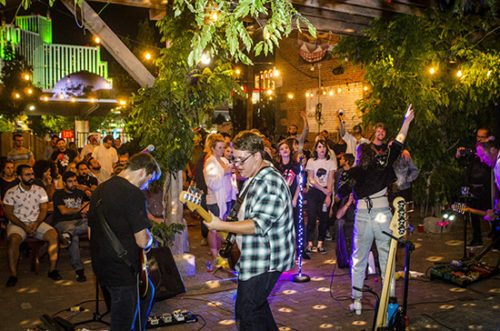 Miller praises the increasing breadth of genre in Reno’s music scene. Blues bands and singer-songwriters aren’t enough for him and the town. He said a crucial step Reno needs to take is venues treating local bands with the respect they deserve. He said in business, a part of respect is money, and if you want people to stay and be part of a scene, you have to treat them like you want them there. The audience packed shoulder-to-shoulder in Lincoln Lounge’s patio were ready to pay respect and had nowhere else they wanted to be. Hopefully venue owners will recognize the devotion.